New York based SpaceTime has released SpaceTime 3D, a web browser that literally takes tagged browsing 3D. SpaceTime allows users to map out their browsing progress in a visual timeline, treating each site as an object that can be manipulated and rearranged within the 3D environment. Users can alternate between a 3D and 2D perspective as required. SpaceTime’s search functionality loads multiple search results as a stack of separate pages, simultaneously loading 10 results at a time, each in its own window. 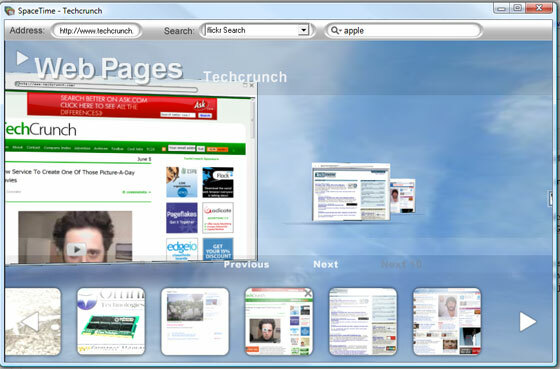 Users can the flip through results, re-arrange the pages or manipulate them. SpaceTime search currently supports Google, Google Images, Yahoo!, Yahoo! Images, Flickr, eBay and others. It’s difficult to describe the user experience. 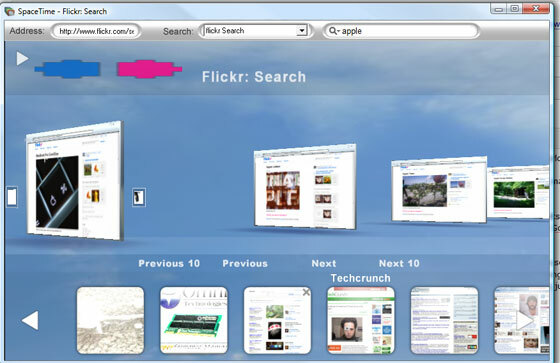 It’s pure eye candy, sort of like Second Life meets Firefox. As a standalone browser SpaceTime 3D lacks most of the extras you’d expect from a browser. There’s no bookmark support, there’s really nothing aside from the 3D rendering and search. I can’t see people abandoning their traditional browsers to embrace this; however the barrier to success comes not from millions of users, but from enough users to see a return through direct deals with Google and others through search affiliation fees, the same model used for Flock and Firefox.